Paradise is not simple to define. If one wants to avoid using concepts of religious nature and prefers considering valid the hypothesis that the garden of Eden is also on the Earth, we would certainly imagine it as fraught with the things and persons we like most. For the Owner, sailing with his family onboard his yacht, driven by the wind, is certainly worthy of having on his boat's transom the name "Paraiso" (Paradise in Spanish). For further information, contact: Alloy Yachts; PO Box 21480; Henderson - Auckland; tel. 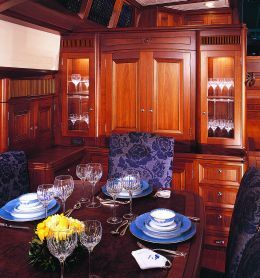 +64 9 838 7350; fax +64 9 838 7393; e-mail address: mailbox@alloyyachts.co.nz; website: www.alloyyachts.com. The longing for a boat like "Paraiso" was born after the owner and his family spent a vacation on board a chartered yacht along the Irish coast. That event triggered the dream of sailing around the world on their own boat. "Paraiso" is the biggest boat this family ever owned, even if they all cruised and raced first on a 65 footer and then on a 105 footer. The owner requests were the following: good sailing performance, good habitability for long crossings for the Owner, his wife, his adolescent son and possibly their guests, good maneuverability, a medium-sized hull capable of sailing anywhere yet not too long in order to reach places where draft would otherwise limit accessibility. These were the guidelines that Ted Fontaine, the designer of "Paraiso", had to keep in mind when designing this 108' sloop. 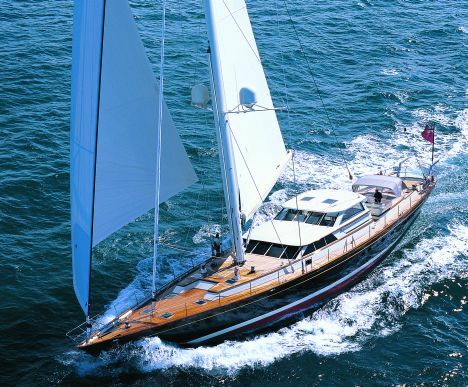 He opted for a mobile keel and a powerful sail plan easily maneuvered by a small crew. In order to meet the owner's requests on habitability, Fontaine created a comfortable helm station with a U-shaped sofa surrounding a table that may be eventually lowered to create a movie theater. From inside the helm station, one can control the whole deck of the boat and have a 360° view of the horizon, making it ideal for navigation and for enjoying small bays at anchor. 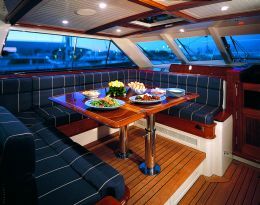 The deckhouse also includes a split-deck with a C-shaped settee; opposite there is the galley with table and surrounding settees. The dashboard, occupying the superstructure's width, is forward of the galley; the steering wheel and chart table are installed in the ideal position for maneuvering and for navigation. On deck, aft of the superstructure, there are two steering wheels for full control of maneuvers and of the sail plan. 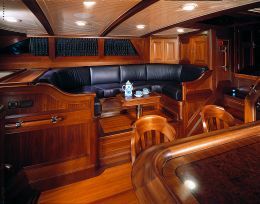 The cockpit is abaft with central table and surrounding settees and, when needed, it may be covered with a bimini top supported by a stainless steel frame. The forward extension of the deckhouse, on the main deck, houses the tender without hindering foresail and staysail movement. 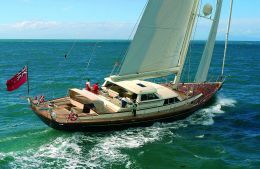 As already mentioned above, as the Owner wanted a powerful yet manageable sail plan the designers created a sloop with a full- batten mainsail on a carbon-fiber mast with four set of spreaders and a carbon-fiber boom. The spar was custom-built by Southern Spars and the rigging by Navtec Rod Rigging. For easy maneuvering, motorized winches were installed and sheets and halyards were concealed in a hollow space on deck. Sail hoisting and lowering can be carried out by simply pressing a button. The construction material preferred and chosen by the yard was of course aluminum, in consideration of its light weight, of the absence of molds and because it allows designers to position weights where needed. Interiors include three cabins. The full-beam master stateroom is aft. It has independent access from deck, double bed to port, office table, vanity, hanging lockers and en suite bathroom with separated bathtub. The second access is from the corridor from which one can access the guest cabins as well. These are amidships, along the fore-and-aft axis, one to starboard and the other one to port. The first one includes double bed, settee, hanging lockers and en suite bathroom with separate bathtub. The latter is fitted with twin beds along the fore-and-aft axis and two additional Pullman bunks totaling four berths, en suite bathroom with separate shower stall and lockers. 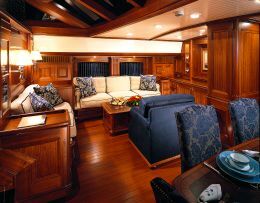 Going forward there are the covered full-beam salon and dinette which are also accessible from deck through the central companionway stairs. The crew quarters are in the bow area and include the galley with a small dinette and sofa and two cabins (one with double bed and the other one a Pullman cabin with two bunk beds) with en suite bathroom. This is the third yacht designed by Fontaine for the Kiwi yard. In this case, as in others, the waterlines were designed on the basis of a hull called Delta Hull developed by Fontaine and Ted Hood more than twenty years ago but still very much appreciated for its performance and ample inner spaces. Thanks to this design the Fontaine Design Group succeeded in creating deluxe and cozy interiors, which efficiently meet the initial Owner's requests for spending long periods on board with extra comfort.